Pulp Fiction font here refers to the font used in the poster title of Pulp Fiction, which is an American crime film directed by Quentin Tarantino. 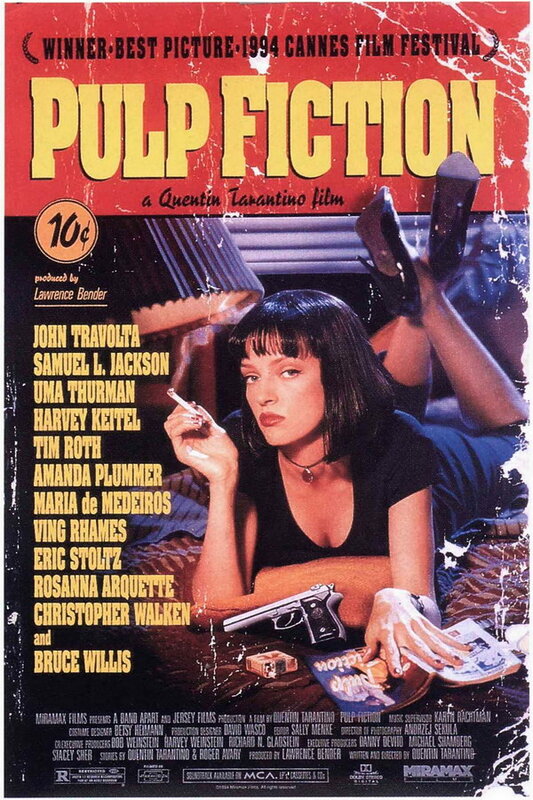 The font used in the poster title of Pulp Fiction is very similar to a slab serif typeface called Aachen designed by Colin Brignall and Alan Meeks. The font is available in two styles, Aachen Medium and Aachen Bold. The typeface is a commercial one and you can view more details and purchase it here. In addition to Pulp Fiction, Aachen typeface is also used in the following logos, movie posters or album covers etc., including: Boyz n da Hood, Down and Dirty, Nature Calls, Desert Kickboxer, The Departed, Buffalo Wild Wings, Masha and the Bear, Deadliest Catch, Football Manager 2016, The Game Plan, Copper, God Hand, Merril Lynch, Machete Kills, Paw Patrol.